I’m not much of a puzzle person. They seem like they would be fun to put together. But when I open the box and see all the pieces, I can’t envision the completed picture when all those pieces fit together. So I tend to give up before I even get started. For the past 6 years God was putting together pieces of a puzzle in my life and I wasn’t even aware of it until it was completed. It all started when my family and I moved to Tennessee in 2007. We knew God was calling us there and we thought the reason was to take care of my grandmother. But six years later and with the puzzle complete I can see that there was so many more pieces that I didn’t recognize until the puzzle was completed. 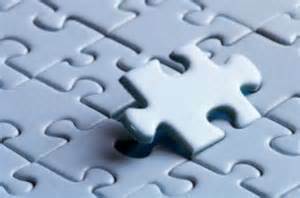 Many times in our lives we can’t see how the challenges in our lives will fit together as part of God’s plan for us. We only see the individual pieces of our circumstances and fail to miss the big picture that He is creating. 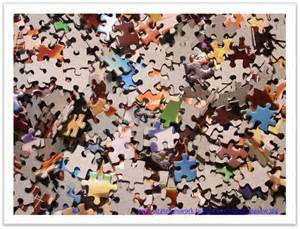 When we allow ourselves to focus on the chaos of all the pieces of the unformed puzzle, we miss the opportunity to trust God that He is putting all the pieces together according to His will for our lives. I spent most of the last 6 years focused on the individual pieces. I didn’t realize how God was putting it all together to form a beautiful picture of one of the most special seasons of my life. Our move to Tennessee wasn’t an easy one. Florida was home. We had friends, church family, jobs and a wonderful home. We were excited to live near our family again but that’s where the excitement ended. But nevertheless, in December of 2007 we headed north – the first challenging piece of the puzzle. We moved my 95 year old grandmother in with us almost immediately. It didn’t take long before all my preconceived expectations of having her live with us were shattered. Being a caretaker turned out to be the hardest thing I’ve ever done – the 2nd piece of the puzzle. And I spent much of my time fixated on this piece of the puzzle and wondering why God would place me in such an arduous position for so long. And then there were the other responsibilities. I was also a wife, a mom, a church administrator, a small group leader, a children’s ministry teacher, the chief housekeeper and yard person, a friend, and a daughter to parents who no longer lived hours away but mere minutes. Balancing it all had become the 3rd piece of the puzzle and it was demanding much of my attention. And then it happened. After almost 6 years there, I experienced a moment I can’t really explain, but I know was from God. One morning while getting ready for church, God revealed to me a beautiful completed puzzle. And in an instance He showed me all the precious puzzle pieces that I had missed along the way because I was too focused on the bigger, more difficult pieces that didn’t seem to fit into my plan. He showed me how the difficult pieces had to be part of the puzzle in order for all the others to fit into their place during this time in my life. There were the people – I met some of the most incredible and courageous women I’ve ever had the privilege to know. The military wives I came to know during that time blessed me in ways they will never know. The fact that our paths crossed was no accident. It was a purposeful plan from God to reveal Himself to me through them. To be able to witness God work in and through them is a gift I will forever cherish. There was our church – I’ve never served with people like the Godly men and women I served with at our church in Tennessee. I will be eternally grateful for the impact they had on me. I learned how to live out the command of loving God and loving others by their example. There truly isn’t a more dedicated and loving group of servant leaders on this planet. I am blessed for having had the opportunity to serve alongside them for that season. There was my family – it was a blessing to be able to live near my parents again. I was able to build on my relationship with them after many years of living several states away and to see my children develop a lifelong bond with them that had not previously existed. It was a precious experience that included creating memories we will never forget. I was also able to reconnect with family that I had not seen in years and introduce my children to family members they probably never would have had the chance to meet had we not moved there. There were my friends – I have a new best friend that I wouldn’t have in my life had it not been for our time there. She is the best friend I’ve waited a lifetime for and was there to encourage me for 6 years while I was focused on my problem puzzle pieces instead of the big picture. And I was also able to reconnect with a childhood friend whose friendship proved to be one of the more precious puzzle pieces of them all. The two of them kept me encouraged and made me laugh during a time that could have easily consumed me. There was my grandmother – what I thought was a struggle was simply a small piece of a much bigger puzzle. In seeing the worst of myself revealed through the frustrations of being a caretaker, I realized just how desperate I am for more of Jesus in my life. He showed His incredible love for me by moving me out of the comfort of my life in Florida to a place where He could show me the areas where I needed to be transformed more into His likeness. And it was through my grandmother that God showed me His compassion and His incredible love for those we may find to be not so loveable. To have her in our home and for my family to have that experience was invaluable. So when the storms and challenges of life hit you, remember that they are only a small piece of an incredible puzzle that God is putting together in your life. Keep your focus on trusting Him and His ability in all things to work for the good of those who love him, who have been called according to His purpose (Romans 8:28). The pieces may seem like a chaotic mess but God will place them in the exact order to reveal a picture He created especially for you. 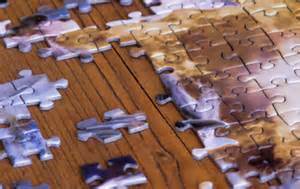 And when that finished puzzle is revealed you will see God’s amazing love for you and know every piece was worth it no matter how difficult it was. Simple, right? Well, as they say, it’s easier said than done. Recently we had our home for sale. We felt certain it would sell quickly and the activity when we first listed the home confirmed to us that we’d have it sold in no time. The initial excitement quickly faded. People quit coming to look and no one was taking flyers from the “for sale” sign. And so it began. I started to doubt that it would ever sale even though I knew that we had prayed about it and we were certain that God had put in our hearts the desire to move. When there was activity I trusted God to work it all out. But as soon as the activity ceased, I began to doubt. 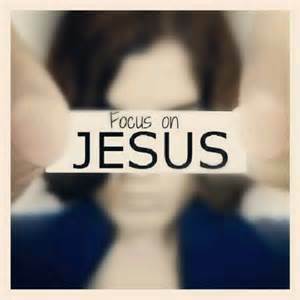 I began to focus on what I could see (which wasn’t much at that point) and took my focus off of God. 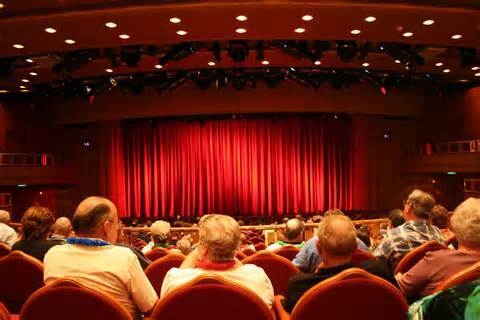 Have you ever worked the curtains for a theater production? 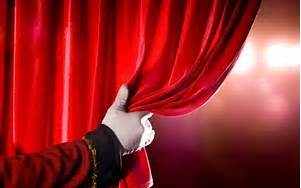 My son is an actor so as a stage mom, I’ve done my share of opening and closing the stage curtain. The job itself gives you an interesting vantage point. As you stand just offstage you have a unique view of what’s happening on both sides of the curtain. On one side you can see all the stagehands running around quickly and quietly backstage setting up the next scene and the actors hurriedly taking their places before the curtain begins to open. It’s ordered chaos as everyone works as fast as possible to make sure that everything is perfect when you begin to pull the rope. On the other side you can see the audience. They sit patiently and quietly waiting for the next scene to begin. They can’t see anything happening and they really have no idea everything that’s going on just beyond the curtain. But they trust that when that curtain opens, everything will happen just as the program they hold in their hand has promised it will. They can’t see what’s going on behind the scenes but they don’t sit in their seats thinking “we might as well go home because the play isn’t going to happen.” They know that even though they can’t see it, it will happen but only when everything that is going on behind the scenes has been perfectly set into its place. Oh how I could have used that reminder when we were selling our house. When I couldn’t see anything happening I failed to remember that God had everything under control. That He was working behind the scenes, setting everything into place so that when the right moment came, the curtain would open and His perfect plan would be revealed. One Sunday after church we were fixing lunch when someone rang the doorbell. I went to the door and there was a couple there. They asked if we would be willing to show them the house. The lady began to tell me that she had been looking at our house online for weeks. She had seen it as soon as it was listed and it was exactly what they’d been looking for. They hadn’t had a chance yet to come by in person because they lived out of town. She said she had looked at it online every day until that day and couldn’t wait to see it in person. Within three days of the showing, we had come to an agreement and they bought our house. God was working behind the scenes. Even when I couldn’t see anything, He was at work orchestrating the sell of our home. I couldn’t see what was happening so I wrongly assumed that meant nothing was happening. I was focused on the lack of activity and my very limited ideas for a solution. I should have been focused on trusting God and believing that He can work things out in ways I could never imagine. 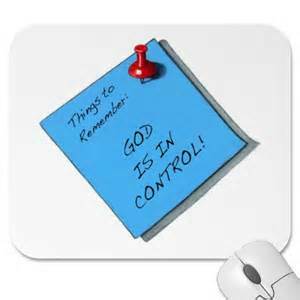 It was a reminder (one of many in my life) that God is in control. Our job is not to figure out how things should happen or when. Our job is to trust Him and believe Him when He reveals a promise to us. What has God promised you that, from your vantage point, doesn’t look like it’s going to happen? What is it that you have lost hope in? The problem may simply be that you lost focus – you’re eyes are focused on the situation and not on the One who is in control of it. Refocus and trust that there are things going on behind the scenes and when everything is in place, the curtain will open to reveal God’s perfect plan for you. Prayer is the key to heaven but it is faith that unlocks the door. I’ve always liked to write but never imagined it would be something I would do to encourage women much like the women who encouraged me so many years ago when I had reached my lowest low. When I'm not writing I love to read, mostly fiction and news. I'm extremely patriotic and cry every time without fail when I hear the national anthem. I served 4 years in the United States Navy and those were some of the best and most meaningful years of my life. I love sports, not participating, just watching on television . My all-time favorite show is “24″. I like to spend time at home alone or doing something with my family and not much in between. I love to travel and I love Africa. I like cats more than dogs and I’m kind of a neat freak. I get excited about purses, new books to read and school supplies (what in the world does that say about me?). Those are the simple facts. For more about me please click on the "About Me" link at the tope of the page.